I swear this recipe is very easy. It was a last minute type of recipe I adapted from the Pioneer woman, but with a Nigerian twist to it. I had to run some errands with my ajebutters and all I had brought out from the freezer were the shrimp. 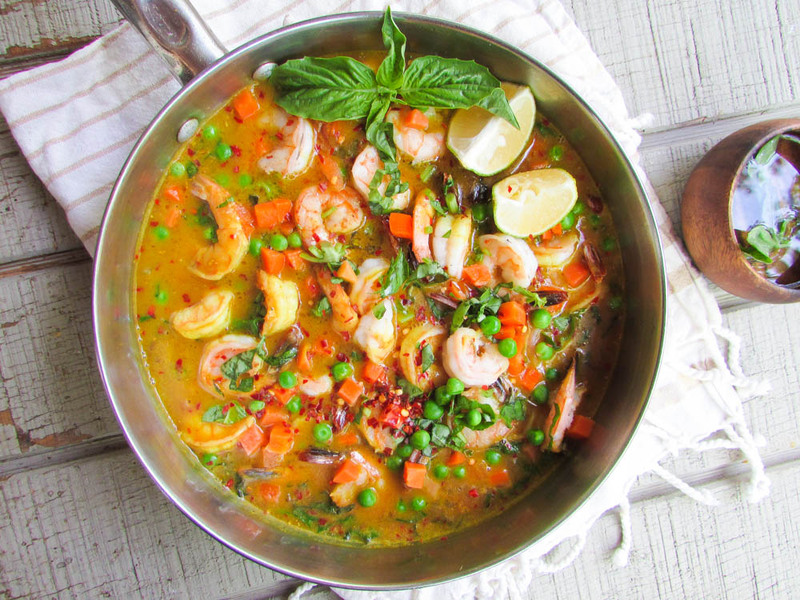 I was so mad at myself because I did not know what exactly to do, so I googled and found Ree Drummond’s recipe for shrimp curry. 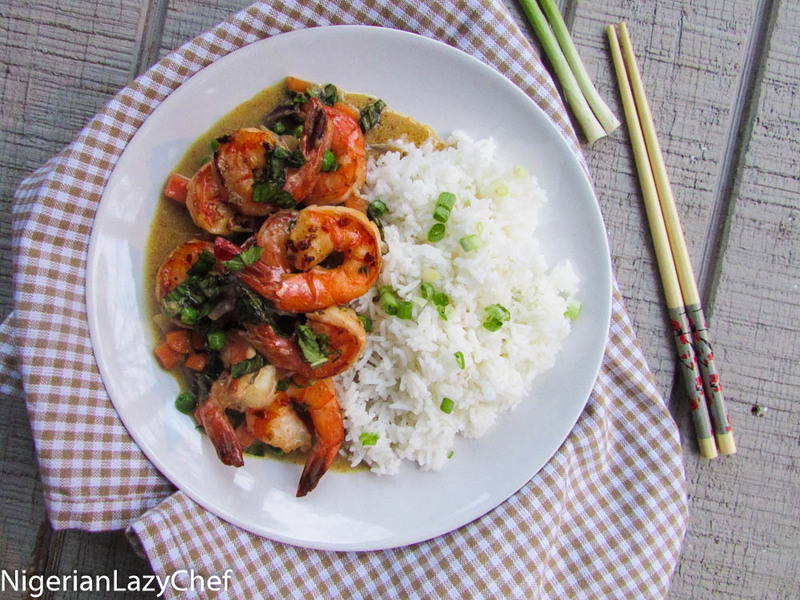 I have always loved her and her coconut curry shrimp happens to be my current favorite. While I was making this dish, one of my ajebutters kept saying, “I don’t want curry mommy, why can you not make stew?” ‘Nigerianized‘ aren’t we? But you had to have seen her digging into her curried shrimp and rice. Whoop! I was so pleased. Because two things happened not too long ago: Like I had mentioned, my son got diagnosed with food allergies and my daughter has recently started being picky. But good thing she loves stew and this curry was a hit, so saying it is a children palate pleaser wouldn’t be too far fetched. One good thing about this curry is that it is quite versatile. The recipe is quite flexible and you could eat it with whatever side. From rice to yam…yes yam my people! You could add veggies to the curry too, Spinach goes great with it. The first time I made it, I used peas and carrots as that was what I had available. 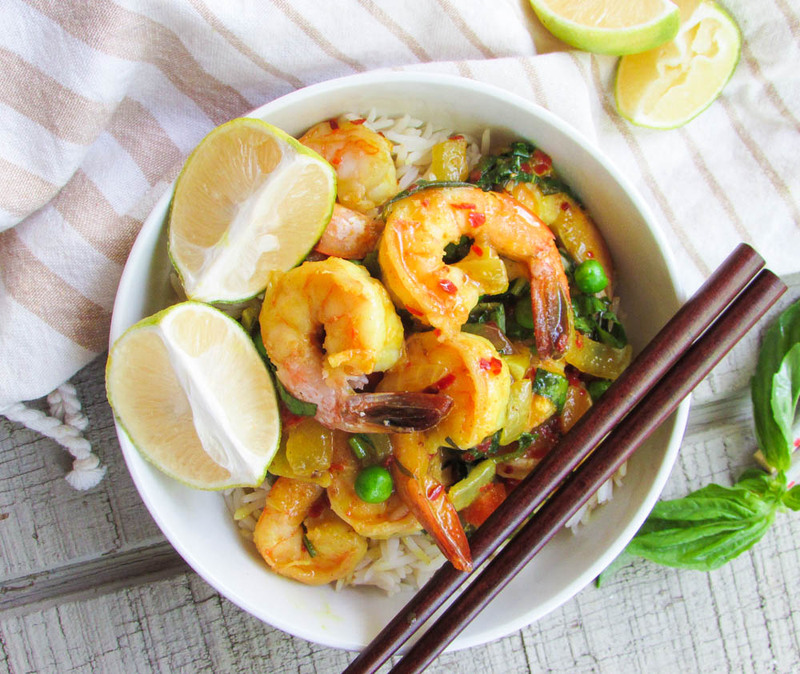 The best way to enjoy this curry is by eating it with Jasmine rice as a side. And if in any event Jasmine rice is not available, Basmati or any regular long grain rice would do. It is just imperative that you understand that this sauce is the bizknees! Heat 1tbsp of butter or coconut oil in a pot, season the shrimp with a little salt and cook in the butter until they have turned pink; then remove from the pot and set aside. Pour the remaining butter or coconut oil into the pot and sauté the onion until translucent; then add the garlic and ginger and sauté until fragrant. Add the curry powder and stir for a minute. Pour in the coconut milk, habanero, lime juice and honey. Stir very well to combine. Season to taste with a bouillon and/or salt. 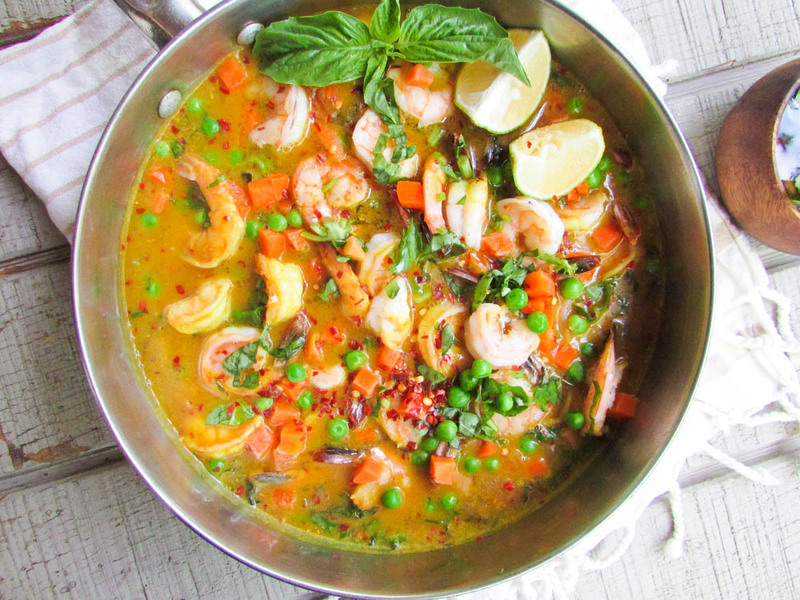 once the sauce starts to cook, reduce the heat and add the shrimp. Let the sauce bubble; then add the basil (or scent leaves), uziza leaves and check for seasonings. Then set aside before serving. 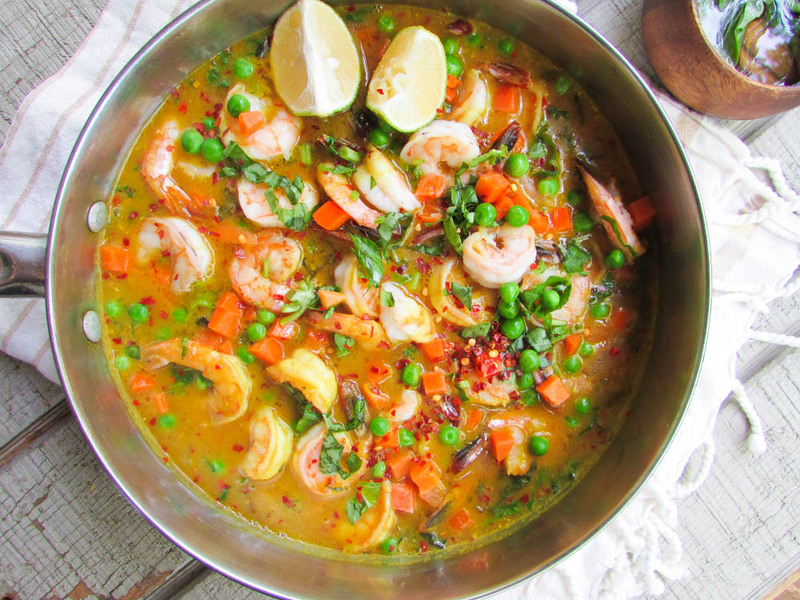 This entry was posted in Curry recipes, Eating Healthy, fish, Fish Curry, Fish recipes, Gluten free recipes, Healthy Holiday Recipes, Protein, Protein Dishes, Sauces, sea food, sea food recipes, Seafood, shrimp curry, Soups and tagged coconut curry shrimp recipe, curried shrimp recipe, curry recipes, curry shrimp recipe, Nigerian food blog, pescatarian recipes, Shrimp curry, shrimp curry recipe. I am so stealing this recipe. Will show you the outcome when I make it. BTW, your blog is great. Will be stealing recipes from it regularly. You made me add coconut cream to the regular sauce I make…and did I love it?? 🙂 well done, namesake!!! I don’t usually comment on blogs but this curry sauce is the bomb, thank you so much for sharing your recipe ? Hey Nma, Just wanted to drop a quick note. Love your blog! Love your spirit! Love the down to earth way you blog. I feel like I know you ( dnt be scared – I’m not a stalker). Wanted to give you a shout and encourage you as I never comment online, but felt I needed to. Go girl….keep doing you thing and keep it real. God bless. nice recipie. gonna enjoy it with a cup of fresh naturally prepared juice. but I have a question, what type of vegetables will be in the the cup of mixed vegetables mentioned among the ingredients.